OUR MOST EXCITING NEW PUBLIC EVENT for 2017! In a first-time collaboration, The San Angelo Museum of Fine Arts & EnPleinAirTEXAS are collaborating with the San Angelo Rodeo Association to bring together some of the best Plein Air Artists and Tie-down and Steer Ropers in the world! ROPING A PAINTING in 2 ½ hours! Come out to the Fairgrounds and wander among the horses and cowboys and prize goats and lambs… and ARTISTS! Artists? You bet yer’ lucky horseshoe! At 9:00am, with paintbrushes ready, artists from at least 19 states, Nova Scotia and Italy begin to paint and try to lasso the essence of West Texas on their canvases in a short 2 ½ hours. Artists may choose from the indoor roping competition at the 1st Community Federal Credit Union Spur Arena, the Junior Livestock Show with over 400 youth and their animals, or any of the roping fiesta areas with the cowboys and their horses. At 11:30am, with a big HOOEY!, the artists stop painting and frame their artwork for judging. A HOOEY is the final loop by the rider when roping a calf. HIGH NOON ~ all paintings will be in the judging area on their easels in front of the Housley Communications Cattle Barn for judging. This is the building with the big red star in the pavement. Awards will be presented shortly afterwards by 2017 EnPleinAirTEXAS judge Roger Dale Brown. This is your opportunity to see and purchase the artwork created this morning all over the fairgrounds! Meet the artists and take home an amazing souvenir of the day! CALLING ALL ARTISTS! Anyone may enter – adventurous amateur to professional artist. A $10 entry fee may be paid the morning of the event at the fairgrounds between 8 and 9am. You must bring your blank canvas or paper and have it checked and stamped that morning when you register. Bring paints, stool, easel, frame, all necessary supplies. 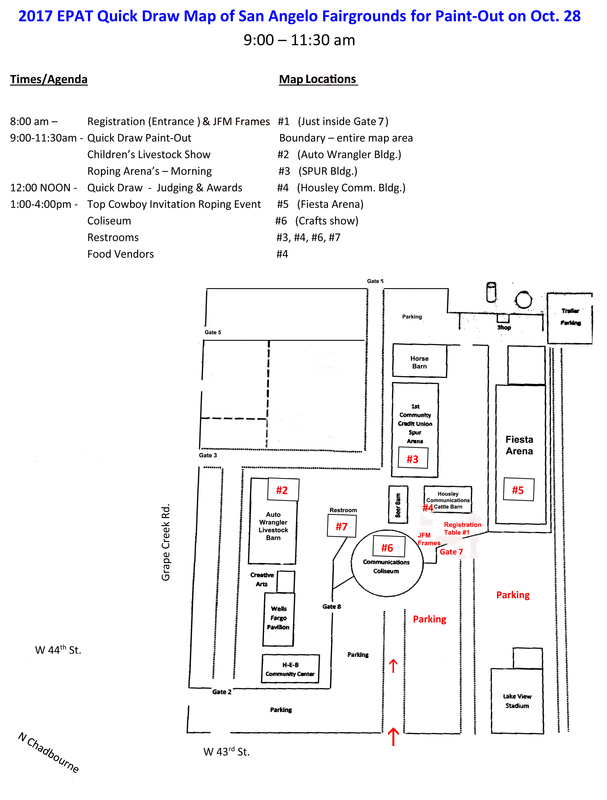 You may set-up in the areas on the fairgrounds shown on the map you will receive at registration. All paintings must be for sale, with 25% of the sale price donated to the San Angelo Museum of Fine Arts. Separate judged category and prizes for EnPleinAirTEXAS Competition Artists and the Open Artist Category. Free entry to the fairgrounds until 11:00am. Any visitors coming after 11am must pay a $12 entry fee, which also gets them into the afternoon Cinch Roping Competition.